As part of today's Japanese-language Kojima Station video broadcast, Kojima Productions has announced that the formerly platform-exclusive content for Metal Gear Solid: Ground Zeroes is coming to other platforms from next month. Specifically, the Raiden mission formerly exclusive to the Xbox versions of the game is coming to PlayStation 3 and 4, while the Deja Vu mission, which incorporated a PS1-era Solid Snake character model and which was previously exclusive to the PlayStation versions, is coming to Xbox 360. The Xbox One version wasn't mentioned because the console hasn't yet been released in Japan, and the broadcast was specifically focusing on Japanese players. The content is coming to Japanese players on May 1 and will be free, added to the game via a patch. 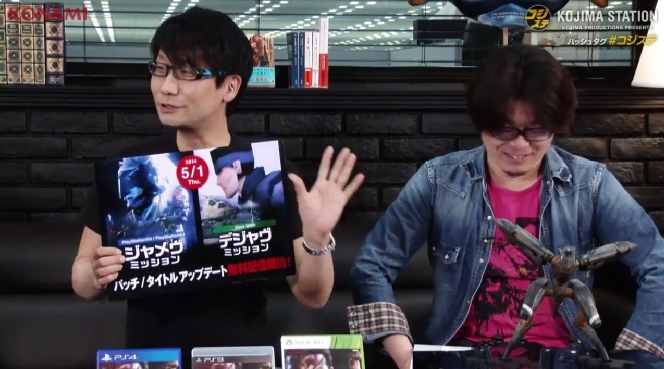 It hasn't yet been confirmed for Western players -- including Xbox One owners -- but the English Kojima Station stream is set to take place at 7pm Pacific tonight (10am tomorrow Japanese time) so expect to hear one way or the other then. Check in on the official site to watch the stream when it happens. Tagged with groundzeroes,	mgs,	mgs5,	mgsv,	News,	PlayStation 3,	PlayStation 4,	PlayStation3,	PlayStation4,	Xbox 360,	Xbox One.